In today’s world, efficient practice management can be the difference between landing or losing opportunities. This session will dig into practice management, currently debated specialized topics, and will assess various tools all valuators should have in their tool chest to help meet the challenges in developing a business valuation analysis. The panel will provide tips on practicing solo and how a business valuation practice thrives in a CPA firm. The panel of instructors will also express insights on marketing and specialization. Mr. Peter Agrapides is a principal with Western Valuation Advisors where his practice focuses primarily on valuations for gift and estate tax reporting, litigation support, financial reporting, and buy-sell agreements. These engagements have ranged from the valuation of small, family owned businesses, to companies with over one billion dollars in revenue. Mr. Agrapides has extensive knowledge of valuation related judicial case law. 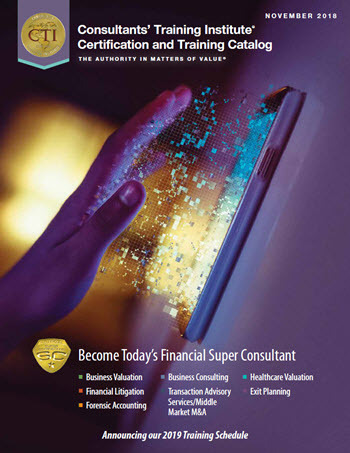 He produces a regular column in The Value Examiner®, a national professional development journal published bi-monthly by the National Association of Certified Valuators and Analysts™ (NACVA®). His column highlights both federal and state-level court opinions. Mr. Agrapides also produces a monthly column that appears in the NACVA QuickRead™ and KeyValueData®’s Case Law Monitor. He is a frequent lecturer on the subject of judicial perspectives and trends in the valuation profession. Mr. Agrapides received his BA in Economics from the University of Utah, and MBA from the Gore School of Business at Westminster College in Salt Lake City, Utah. He holds the Certified Valuation Analyst® designation from the NACVA. Mr. Agrapides was elected to serve on NACVA’s Valuation Credentialing Board in 2010 and is a member of the Current Update in Valuations instructor team. He was named NACVA’s Outstanding Member in November 2010. Mr. Marc Bello is a nationally recognized expert in business valuation and forensic accounting. He has appeared as an expert witness in the United States Tax Court as well as Massachusetts superior and probate courts. Attorneys seek Mr. Bello’s expertise in the area of business valuation, litigation support, forensic accounting, lost profits, business interruption, economic damages, and taxation. Mr. Bello has authored numerous articles related to divorce, forensic accounting, and family business operations. He is a frequent lecturer on issues of business valuation and forensic accounting at conferences around the country. A regular instructor for the National Association of Certified Valuators and Analysts™ (NACVA®), Mr. Bello has been the lead instructor for the Current Update in Valuations course since 2007. He is also an instructor for the Intermediate Business Valuation Training Center. Mr. Bello is the co-editor in chief for Around the Valuation World® and is serving a three year term on NACVA’s Forensic Litigation Board. He currently sits on the Family Law Advisory Committee for Massachusetts Continuing Legal Education and is the treasurer of Camp Bauercrest in Amesbury, Massachusetts. Mr. Bello is the past chair of NACVA’s Executive Advisory Board, Valuation Credentialing Board, and Educational Quality Assurance Board. Mr. Robert Grossman has practiced in the public accounting arena for over three decades. During his career, he has developed a significant base of experience in operational, tax, and valuation issues that affect privately held businesses and their owners. The breadth of his involvement encompasses the development and implementation of innovative business and financial strategies designed to maximize owner wealth by minimizing overall tax obligations and optimizing operational performance, resulting in business value enhancement. After graduating from St. Vincent College in 1979 with highest honors in Accounting, Mr. Grossman joined an international accounting firm in Pittsburgh and later earned a master of science degree in Taxation with honors from Robert Morris University. He is a CPA in Pennsylvania and Ohio. He attained his National Association of Valuators and Analysts™ (NACVA®) qualification as a Certified Valuation Analyst® (CVA®) in 1992. Mr. Grossman is Accredited in Business Valuation by the American Institute of Certified Public Accountants® (AICPA®) and has attained a Certificate of Achievement in Business Valuation from the organization. He also carries the well-recognized credentials of Accredited Senior Appraiser and Certified Business Appraiser™. Mr. Grossman has been a member of NACVA for 20 years. He served on NACVA’s Executive Advisory Board and is a past chair (2006/2007); he is also past chair of NACVA’s Education Board (2003/2004). He currently chairs NACVA’s Standards Committee and he is a member of the Ambassadors’ Club. He also serves as an instructor for the Current Update in Valuations team as well as the Business Valuation Accelerator Workshop and Advanced Valuation: Applications and Models class. Mr. Grossman is a member of the American and Pennsylvania Institutes of Certified Public Accountants and previously chaired the Pittsburgh Committee on Taxation. He is a member of the Allegheny Tax Society and past board member of the Pittsburgh Chapter of the American Society of Appraisers, as well as current member and former president of the Estate Planning Council of Pittsburgh. Mr. Grossman served as a national instructor for the American Society of Certified Public Accountants, for which he taught advanced business valuation classes to professionals. He has served as an adjunct professor at Duquesne University in Pittsburgh, teaching business valuation theory to students in the MBA program. He also serves as a Subject Matter Expert as an Advisor in Pittsburgh-based Carlow University’s Master of Science in Fraud and Forensics Program. Mr. Grossman is well-known nationally, and in the Pittsburgh and tri-state business community. He has written numerous articles for several national and area business publications, as well as professional trade journals, including The Value Examiner® and the CPA Litigation Service Counselor. Finally, he is a contributing author of Financial Valuation-Applications and Models, edited by James Hitchner, and serves on the panel of experts for the Financial Valuation and Litigation Expert. Additionally, Mr. Grossman is a frequent speaker on various topics of interest to people associated with closely held businesses. He has been a guest on radio talks shows discussing taxpayer problems during the filing season. He resides in Westmoreland County, Pennsylvania, with his wife, Susan. They have two children, Matthew and Alyssa. Mr. Garth Tebay is a practicing Certified Public Accountant, Certified Valuation Analyst® (CVA®), Master Analyst in Financial Forensics™ (MAFF®), and Certified in Mergers and Acquisition Analyst (CM&AA®) with over 43 years of experience. He is the founder and managing partner of Value Defined™; managing director of Headwaters SC Valuation Services LLC, a business valuation and litigation support firm in Perrysburg, Ohio; and an affiliate board member of Business Growth Alliance, which provides value growth consulting and investment banking services to owners of medium-sized businesses. He is also the managing partner of Tebay & Associates LLC, a full service accounting, tax, and consulting firm in Perrysburg, Ohio. Mr. Tebay received his bachelor of science in Accounting in 1972 from Findlay College in Ohio. He then received certification as a Public Accountant in 1975. In 1997, he became a CVA, was awarded the CM&AA in 2001, and received certification as a Certified Forensic Financial Analyst in 2008. He is a member of the Ohio Society of Certified Public Accountants, the American Institute of Certified Public Accountants® (Tax Division and Consulting Services Division), and the Alliance of Merger and Acquisition Advisors®. Mr. Tebay is a member of the National Association of Certified Valuators and Analysts™ (NACVA®), through which he is a member of the Education Quality Assurance Board (EQAB), NACVA Standards Committee (provide interpretations and expand upon technical standards), NACVA Training Development Team, NACVA Course Review Committee (dedicated to reviewing NACVA’s substantial curriculum), member of NACVA Mentor Support Group, NACVA Current Update in Valuation Team, and NACVA Speakers’ Bureau, as well as many other local memberships. Mr. Tebay currently serves on the MPPA Advisory Board at Ohio Northern University. Over the years, he has held offices and served on many boards for local organizations. In May 1983, Mr. Tebay was awarded the Accounting Advocate of the Year Award from the U.S. Small Business Administration. Again, on July 24, 1997, he was awarded the Accounting Advocate of the Year Award for Northwest Ohio by Senator Linda Furney on behalf of the U.S. Small Business Administration. On June 24, 2007, Mr. Tebay was appointed by Ted Strickland, Governor of the State of Ohio, to The Executive Order of the Ohio Commodore. In 2008, he founded Tebay & Associates, LLC. Mr. Tebay’s primary focus within the firm is management consulting services, which includes business valuations, litigation support, and mergers and acquisitions. Prior to founding Tebay & Associates, LLC, he was the founder and managing partner of Tebay Mosley Associates, LLC, a partner at Brell, Tebay, Holt & Dettinger, Inc., and CFO/director of Westhaven Services. Mr. Tebay and his staff have performed hundreds of valuations since 1980. He has also been qualified as an expert witness in various municipal and federal courts and has given testimony in divorce cases, personal injury cases, lost profits, economic damages, shareholder disputes, and federal bankruptcy court. He is often called upon to consult in various valuation matters and has handled numerous merger and acquisition transactions. In addition, Mr. Tebay has also served as an arbitrator for the American Arbitration Association. 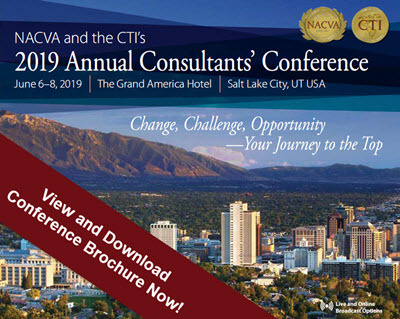 As an instructor for NACVA, he teaches: the Current Update on Valuation; the Fundamental Techniques & Theory (FT&T days one and two); and Asset and Income Applications and Calculations Case (day three) at the NACVA Training Centers since 2001. In 2010, Mr. Tebay was formerly Business Valuation Training Center and Current Update in Valuation Content Manager. He was the co-chair for the Valuation Symposium at the 2011 NACVA National Conference. In addition, Mr. Tebay has presented the valuation program for the Internal Revenue Service, the Small Business Administration (SBIC Division), The Korean Valuation Association, presented Forensic Accounting for White-Collar Crime to the National College of District Attorneys, wrote instructional materials for NACVA program: Business Valuation Fundamentals for the CPA (2005); co-authored instructional materials for NACVA programs Fundamentals, Techniques & Theory, and Case (2005). He has been recognized with NACVA’s Outstanding Member Award (2005); as well as their Instructor of Exceptional Distinction Award in 2003, 2004, 2005, 2006, 2007, 2008; and Instructor of Great Distinction Award in 2002. In addition to authoring portions of the training curriculum, Mr. Tebay has presented numerous seminars on the topic of business valuations. Ms. Courtney Sparks White is a partner at Clarus Partners, LLC, an accounting and business advisory firm in Columbus, Ohio. She heads up the Business Valuation and Litigation Support practice, concentrating her time in business valuation, forensic accounting, economic damages, and litigation advisory services. She has testified in court about business valuations, economic damages, and other financial matters. Ms. White’s business valuation experience encompasses a wide range of industries. She has completed or contributed to hundreds of valuation engagements for numerous purposes, including estate and gift taxation; ESOPs; marital dissolutions; buy-sell agreements; mergers and acquisitions; Subchapter-C-to–Subchapter-S conversions; and other tax, corporate, and litigation related matters. She has experience valuing businesses and business interests in many industries including, but not limited to: automotive, construction, food service, distribution, financial services, manufacturing, healthcare, insurance, retail, and transportation. Ms. White’s forensic accounting and litigation advisory experience includes providing expert and consulting services regarding shareholder disputes, contract disputes, business interruption claims (damages and lost profits), wrongful termination, and financial aspects of family law matters (determination of income, identification of assets, separate property tracing, etc.). Prior to joining Clarus, Ms. White was a senior analyst at a boutique valuation and litigation support firm in Central Ohio. She started her career as a financial analyst at GBQ Partners in Columbus, Ohio. Ms. White received her JD and LLM in taxation from Capital University Law School. During law school, she was a member of the law review as a staff member (2007–2008) and as an executive board member (2008–2009). She received a bachelor of arts in Mathematics from Vanderbilt University with a minor in Financial Economics. She was an Academic All-SEC in 2000 as a member of the Vanderbilt Women’s Golf Team. Ms. White is an Accredited Senior Appraiser with the American Society of Appraisers, a Certified Valuation Analyst® with the National Association of Certified Valuators and Analysts™ (NACVA®), a member of the Ohio State Bar Association and the Columbus Bar Association. She also maintains active registration status with the Supreme Court of Ohio through compliance with continuing legal education requirements. She is also a current member of the NACVA Executive Advisory Board, a former co-editor in chief of the Around the Valuation World monthly webzine, a past member and chair of the Valuation Credentialing Board of the NACVA, a board member (2011 to present) of CASA (Court Appointed Special Advocates) of Franklin County, and a trustee (2013 to present) of Kids n’ Kamp.